Scientists have long believed that water exits on the moon. But now, this belief has finally been confirmed by a team of scientists, led by Shuai Li of the University of Hawaii and Brown University, and including Richard Elphic from NASA’s Ames Research Center in California’s Silicon Valley. 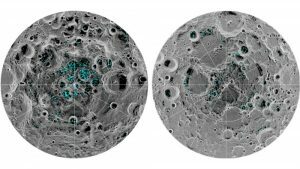 Definitive evidence of water ice on the moon has been directly observed in the cold, dark places near the north and south poles. M3, an imaging spectrometer onboard the Chandrayaan-1 spacecraft, has confirmed the presence of solid ice on the moon. It collected data that showed the reflective properties expected from ice, as well as the unique way its molecules absorb infrared light. The Indian Space Research Organization is planning to launch Chandrayaan-2 in the first week of January 2019. ISRO chairman K. Sivan said further exploration will help us to find out if humans can inhabit the moon in the future.